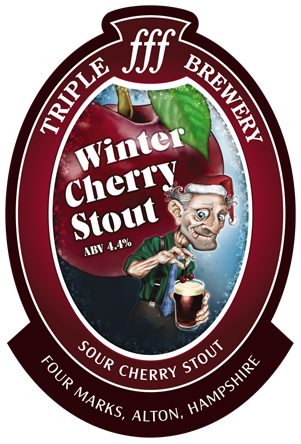 Our Winter Stout returns, injected with a hit of sour cherries. The aroma of black forest gateaux greets you as you start to drink. Chocolate and velvety on the palette with a teasingly tart finish from the cherries. Tangfastic! I left a five litre polypin sitting on the side in my kitchen when I invited some friends around. I said 'try the stout, it's really good'. And then all my stout was gone... Light and easy to drink, but with deceptive kick and heavy chocolateyness that leads on to the interesting sour tang of cherries (very subtly) at the end. Obviously fantastic on its own, we discovered it's also rather good mixed with sweet damson gin - approximately 4 parts stout to one part gin. We called this 'Dark Velvet'... because we're a slightly pretentious middle class bunch.